We are used to working with partners on machined parts production where we can keep costs down and offer a flexible service. Whether that is for prototypes, smaller batch runs or specialist more complicated components, we will work with you to achieve your requirements. Our advice and experience will add value and provide solutions at the design stage and throughout the manufacturing process. If you need help with a particular design, we can advise you on the best method of production and the most cost effective way to achieve the end product. 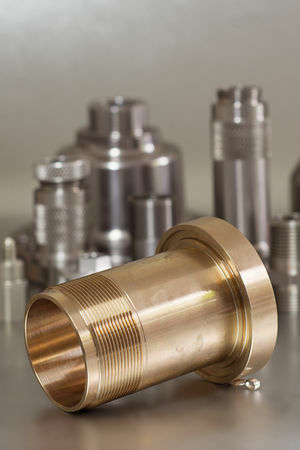 Our CNC machines enable us to provide a variety of finished components. We have invested in our machinery and software to provide you with a fast, quality service. For example, our CNC 2-Axis turning machine can perform 2 operations at the same time, reducing time and cost. All components are programmed using the latest CAD Software; this means components are correct to customer drawings every time. CAD also allows us to programme the next set up while the machine is still producing components. This gives us zero down time which means you get the most competitive price on all of your machined parts from Ashro Cnc Ltd.
Click Here to view some of the industries we work for.